Consolation prize winner Beryl Palmer with winner Rob Miller and runner up Rita Alsemgeest at the consistency championships that took place on November 3. 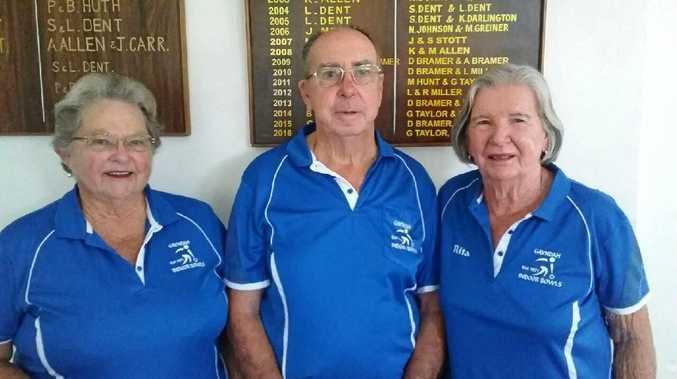 INDOOR BOWLS: It has been a busy couple of weeks for members of the Gayndah RSL Indoor Bowls. On Tuesday October 30, Gayndah played host to 22 visitors from Childers Senior Citizens. Together everyone had a good day. During the day cards were played as well as board games and hoy. Everyone enjoyed a beautiful morning tea, lunch and afternoon tea. The two presidents thanked everyone for the day. The bowlers were then back again on Thursday November 1 for their weekly competition. The top scorer for the night was Boyd Baker with 3 wins and 52 points, in second place was Gary Taylor with 46 points. Other scores for the night were Lyn Miller 40, Muriel Glover 40, Rob Miller 35, Leo Taticek 33 and Rita Alsemgeest 32. On Saturday November 3, a consistency event took place with 10 indoor bowlers playing for the championship. The winner on the day was Rob Miller with the runner up Rita Alsemgeest. The consolation winner was Beryl Palmer. Raffle winners on the day were Leo Taticek and Greg Leaf. It was a very hot afternoon with very keen competition by everyone. During the weekly competition which took place on Thursday November 8, Beryl Palmer was the winner with three wins and 40 points. Kit George took out second place with two wins and 39 points. Other scores for the night were Muriel Glover 24, Rita Alsemgeest 17 and Phillip Grambower 17.